Killer Characters: Color Me Cozy! It's autumn... the leaves are changing, there's lots to do outside still, but soon the weather in Michigan will chill and snowflakes will flutter through the air. In fact, that's already happened; last weekend we had our first taste of snow, a little early, true, and it all disappeared as fast as it came, but soon enough it will start in earnest. There's almost as much to do in fall as there is in spring. The shrubs have to be wrapped, the lawn furniture cleaned and put away, storm windows installed, annual flowers ripped out and gardens covered in a layer of leaves to protect the perennials. The rest of the leaves must be bagged and set out on the curb for green pickup or mulched for compost. Firewood must be bought and stacked close to the back door for the fireplace. But then... then comes the time of year I love, when the outdoor chores are all done and there isn't any snow shoveling yet. Too early to skate or toboggan. Too late for anything outdoors beyond a walk with Hoppy to the river and back. That's when I settle in with a stack of books, all my favorite romance authors, and a few mystery authors, too! Oh, and I've taken up a new hobby, the latest craze... coloring! Grown-up coloring books are fashionable this year, and I'm hoping some of my favorite gift givers will get the hint. So, do any of you look forward to fall for the same reason? Does the thought of a blanket and cup of tea by the fire, accompanied only by a dog, and/or a cat and a stack of books delight you? Tell me what you'll be reading when the snow flies! 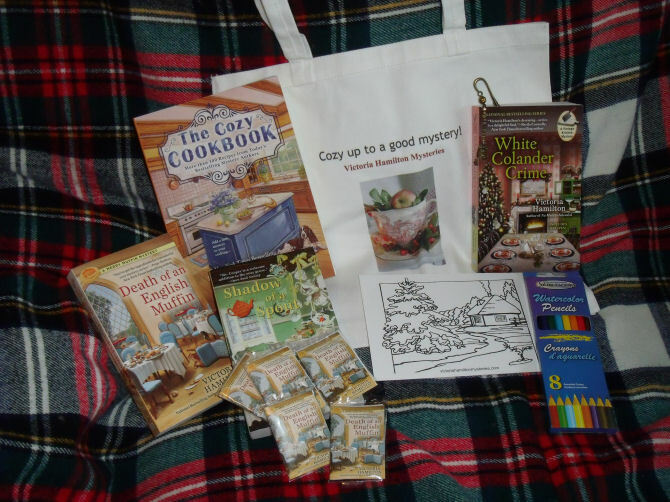 I have a giant giveaway to celebrate Book #5 of the Vintage Kitchen Mysteries, White Colander Crime. 2 - Entries close at Midnight, Thursday, October 22nd. 3 - Watch the replies and your email messages on Friday! 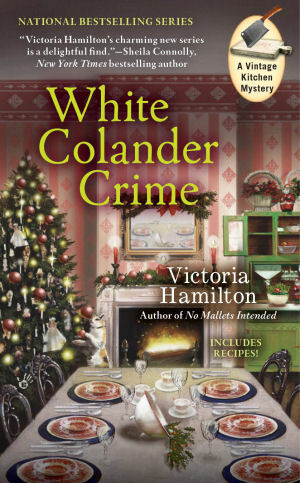 White Colander Crime sounds like a great mystery book, and I love the cover art! I have added the book to my TBR list. No matter the season, a cup of tea, a stack of cozy mysteries, and my kitty-boy by my side make for a good day! Thanks for the chance to win this very generous prize package! I really enjoy this series and can't wait to read more about Dickens Days and see what everyone is up to now! Thanks for the chance to win such a wonderful prize! 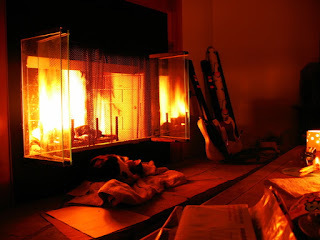 When the snow starts to fly, I will be curled up in front of the fire with a cozy, preferably one with a holiday theme. Thank you for the opportunity!!!! Please enter me in this great giveaway. I would love to win. Thank you for the chance. I am so looking forward to this next book. For the upcoming winter, I will re-reading some old favorites including yours as it's always fun to visit old friends and places. The storyline is like a breath of fresh air. I would love to read this novel. What a fantastic deal!! Thanks for this opportunity. I love curling up with a book, blanket and in the fall tea (winter it's hot chocolate). I'm so looking forward to fall weather. 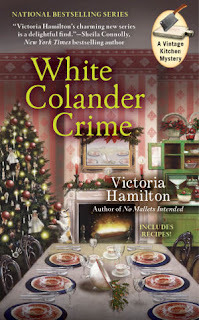 I'm sooo excited for White Colander Crime!!!! Yes, I love autumn for the same reason. Sitting by the fire with tea or hot chocolate with my two dogs. I will be reading a bunch of books, including yours! Thanks for the chance to win this awesome giveaway!!! What will I be reading this winter? I am so far behind that I have 3 boxes of unread cozies that I'll be going through in alphabetical order. Autumn is the time I take the car and have it compounded and hand waxed for the winter. It's when we rotate the closet from summer to winter and make sure that we have plenty of our favorite snaks stashed away and almost forgotten. I love the books you have in the giveaway, and I also collect those wonderful tote bags. They make great gifts to the librarians I drop off bookmarks and cover cards to. Awesome giveaway! In the winter I curl up on the couch with my cat and cocoa and read cozies and mysteries! Thanks for the chance! I hibernate in the winter - it gets pretty darn cold in MN! I'm so looking forward to White Colander Crime. Your series is terrific! Wow so many great cozy mystery. I can't wait for the snow to fly! I will be reading more of my cozies that take place in winter then. And working Jigsaw puzzles. I love winter! I need to catch up with this series. A good mystery works well when the snow starts to fly. I'm a newbie to this series and author. I am looking forward to finding a copy of it to read. Thanks for the opportunity to enter your giveaway. more cozies!! Plus some trillers and mysteries. Thanks for the chance to win. I can't wait to curl up by the fireplace and read this. Thanks for the great giveaway! Thanks for the chance to win. I haven't read this series yet but it is on my TBR list. I am curled up right now reading English Muffin. I do prefer reading in the sun though and this fall has been beautiful. High 70's low 80s. Perfect for sitting and reading. Cannot wait to read the latest book in the Vintage Kitchen series. I love this series. Perhaps it curbs my desire to collect all old kitchen gadgets (probably not). Gray give-away. Count me in on this giveaway. Hope I win cause it sounds like just my kind of mystery. I've got the tea, blanket and kitty all ready to cozy up. Wow I would love to win this! Thanks for the chance. I can't wait to read this, I love all your books, thanks for the chance to win this giveaway!!! I love series books (including the Vintage Kitchen series!) so I'm never sure which book I'll read next - the next book in a series I'm reading or a stand alone book or a new series I can't wait to start. What fabulous giveaway! Autumn is may favorite time of year I love the crisp air, falling leaves, and comforting food. I love curing up inside in comfy clothes with my cats. What a wonderful giveaway! It's hard to type with my fingers crossed. Nice giveaway. Although some of the young folks may not know what a Colander is. Autumn is my favorite time of the year also. Not too hot and not too cold. Lots of color and the pollen count starts to go down. Thanks for this opportunity. What an awesome giveaway! Thanks for the opportunity. I just love cozies. Thank you for an awesome giveaway. I lo e this series and I also love to color. I love this vintage kitchen series. I would be so thrilled to win. Fantastic giveaway...love to read this. Thank you so much to all who entered. A winner has been chosen! Come back November 21st for another HUUUGE giveaway!